Lt. Frank E Oiler, USAAC, 84th Fighter Squadron. P-47D 42-28878 WZ-S "Eileen". Frank E. Oiler served with the 78th Fighter Group, 84th Squadron from June 1944 to March 1945. Before the group changed their aircraft to P-51 Mustangs, Lt. Oiler was assigned two P-47s, both marked as WZ-S. Both aircraft bore the name "Eileen" and carried the striking and highly distinctive checkerboard and yellow wasp nose art shown here. He was based at Duxford airbase in Cambridgeshire, south east England, and the base is now home to the largest aviation museum in Europe. 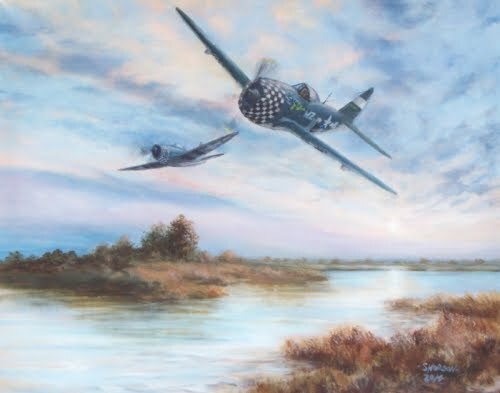 The painting shows "Eileen" and a wingman coming home after a long mission escorting bombers to the German heartland and back again. The scenery is typical of the flat wetlands of the south east coastal areas, and we can see that perhaps the planes are flying a bit too low - but then maybe, after many hours in the cockpit, both pilots just want to let off some steam.